Pura Vida (Pure Life) has become an everyday form of salutation in Costa Rica and is also a reminder that this small Central American country accounts for 5% of the world's biodiversity! In October, 2017, I received a very warm welcome, when I had the pleasure of addressing a group of banking representatives, members of the Chamber of Commerce, and representatives of the British Embassy, at an event we organised on behalf of The London Institute of Banking & Finance (LIBF) and the National Committee of the International Chamber of Commerce (ICC) in Costa Rica. We organised the event in order to present LIBFs Trade Finance Certifications, namely, Certificate for Documentary Credit Specialists (CDCS®), Certificate for Specialists in Demand Guarantees (CSDG®) and Certificate in International Trade and Finance CITF®), designed in partnership with the ICC. 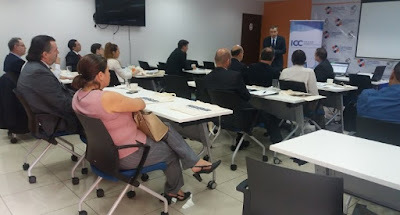 It was also announced that ICC in San José would become LIBFs exam centre, for these certifications, in Costa Rica. It was a very rewarding experience and very glad to see so much interest in LIBFs educational offering and in particular its Trade Finance Certifications. My thanks to Maria Claudia Jiménez, Executive Director of ICC, Costa Rica; Pablo Ledezma Boschini, President of the Banking Commission; Yorleny Araya, Administrative Assistant and Hector. Until next time, Costa Rica!